The Fernbank Museum of Natural History is in the midst of their first annual Winter Wonderland holiday celebration. It would have been difficult to imagine, but the juxtaposition of giant dinosaurs and Christmas trees make for a remarkably gorgeous and intriguing display. The combination of holiday cultural exhibits, performances, storytelling and Christmas trees from around the world make for a festive theme at Fernbank this season…one that's not to be missed. Actually, I unfortunately did miss the first part of the Winter Wonderland celebration, which began in mid-November, but I'm grateful to have seen the tree display. I was on a visit to Fernbank to see the new Water exhibit, so getting to see the trees was a bonus. But they would have been worth an exclusive visit. 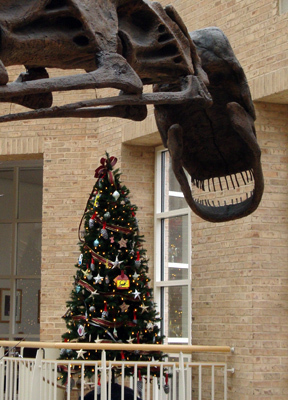 The trees surround the Giants of the Mesozoic in the museum's grand atrium on the entry level. Twinkling lights, representing more than twenty countries, capture the eye and blend with the inescapable presence of the Argentinosaurus creating what I know will be, for me, one of the most unique experiences of this holiday season. Local community partners, such as the Callanwolde Fine Arts Center, and Consulate offices around Atlanta created the various trees in the exhibition to reflect authentically how their respective cultures celebrate the holiday season through tree decoration. 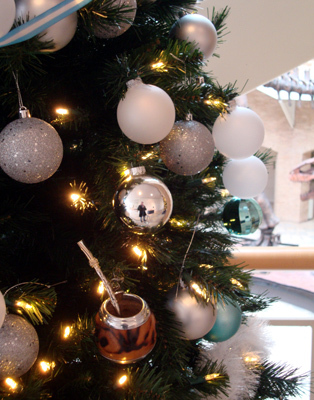 From the origami on the tree representing Japan to the chocolates on the tree representing Switzerland to the Mate cups on the tree representing Argentina, there's an evergreen filled with cultural icons that will please everyone. You'll have to hurry though if you want to see the trees. 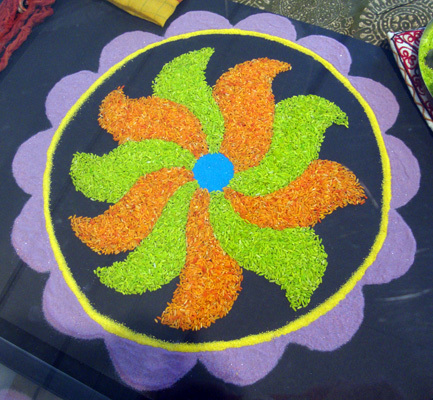 The exhibit closes on Wednesday, January 5, 2011. In addition to the various events of Winter Wonderland and the holiday trees from around the world, there are numerous displays showcasing cultural holiday celebrations around the world. Exhibits featuring Hanukkah (Israel), Diwali (India), and various celebratory events in the Arab World are nestled among the holiday trees to create a truly global experience. Each Christmas tree and other cultural display exhibit is coupled with information about the organization that helped create the exhibit and the country that it represents. Was the twinkle of the world holiday trees enough to bring me back or will the memory fade with the arrival of the new year? I am always on the lookout for new experiences and Fernbank's Winter Wonderland delivered on that front. I also like returning to experience again those exhibits I really enjoyed the first time. So, I am very much looking forward to next year's Winter Wonderland. Hours: Monday-Saturday 10 a.m. – 5 p.m., Sunday noon-5:00 p.m.